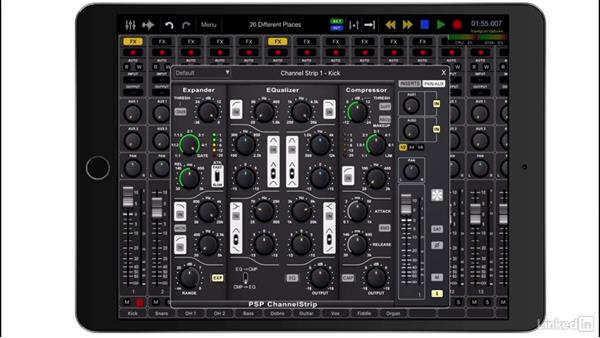 Channel Strip AU3 for iOS? I'm looking for a fairly simple channel strip for use as an insert effect in AUM or similar. Something that sounds good and is quite CPU efficient as I'd be hoping to put it on each channel or Mix Bus. Separate EQ and compression would be fine. I don’t use a single channel-strip app. I add the individual pieces of a channel strip that I need as I need them. AUM includes very lightweight and fairly good built-in eq, stereo processing, limiting and saturation plugins. But you can substitute favorite AU effects for any of them any time you like. If you don’t want to add the plugins every time you create a channel you can always set up a session with a bunch of channels with only the “channel strip” plugins set to neutral settings, with no other apps, then save the session as a starting template. Thanks for the heads up on this one. I already had the graphic eq and completed the bundle. Works in effects slot in AB and AUM and as plug in in Group the Loop. Familiar UI helps too. Not one crash or glitch in AB3 tonight with the new sopranotron, Model 15 and GTL. I'm stoked.